YesWeHack Version 2 : And improvements for all Hunters ! Over the last months, we’ve been hard at work developing our new bug bounty platform. While engaging with you, we’ve made big changes to some parts of our services that needed improvements even a redesign. Today, we would like to share some of these changes with you, and cover the benefits of the update. We have a brand new logo! Our branding is evolving with a new logo and design and we do think it provides a better look and we hope you will like it. We’ve been listening to your feedback about the previous platform experience and thanks to You we were able to develop a brand new user experience. Each hunter now has a profile page through which all his activity within the platform is highlighted including his ranking. 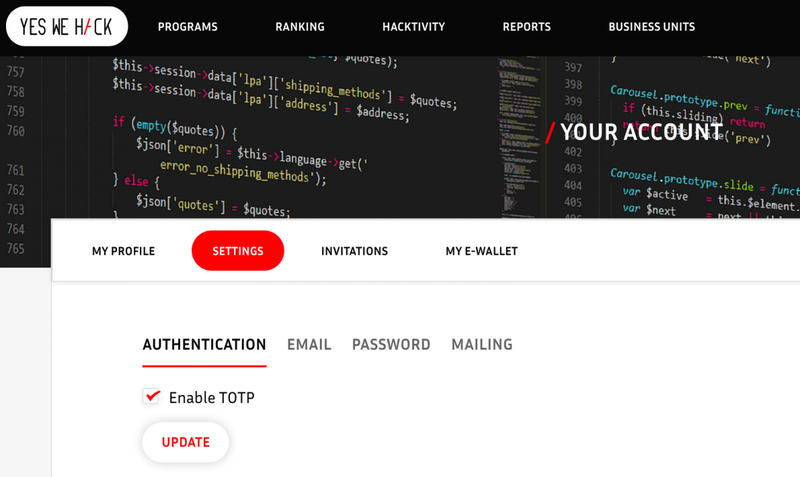 This allows YesWeHack’s client companies to select the hunters and to invite them into their programs based on their impact score or activities. We have integrated a two-factor authentication to increase the security level of your YesWeHack account. The display of a program’s details has been completely redesigned to provide a better user experience. In addition to the traditional information related to a Bug Bounty program, we improved -in a very visual way- the current activity on the program (number of reports, thanks… etc.) but also the reward bracket that the security expert can expect. We have completely reviewed the billing process. This will allow you to comply with the requirements of the tax authorities. It is not always easy for the hunter to follow the evolution of a bounty bug program over time. That’s why we implemented a versioning feature on the program display. We hope that you will enjoy this new version as much as we do. We Wish You a Happy Hunting ! Please be aware that we are still ready to listen to your feedback, questions and/or comments. Soon, we will post about the new features improving our clients’ experience. Partenariat : SODIFRANCE & YESWEHACK.